When Summer and I decided to spend majority of our time in the Algarve we debated over a lot of decisions like which town to stay in, which type of lodging to book and whether to rent a car. One thing we knew for certain was that we wanted to take surf lessons. 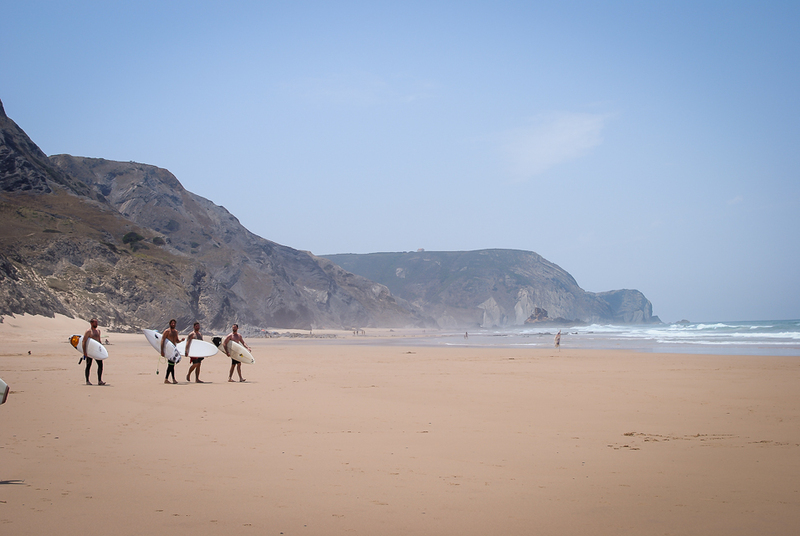 There are a whole host of surf schools popping up in the Algarve offering everything from all female yoga + surf retreats to surfari tours. 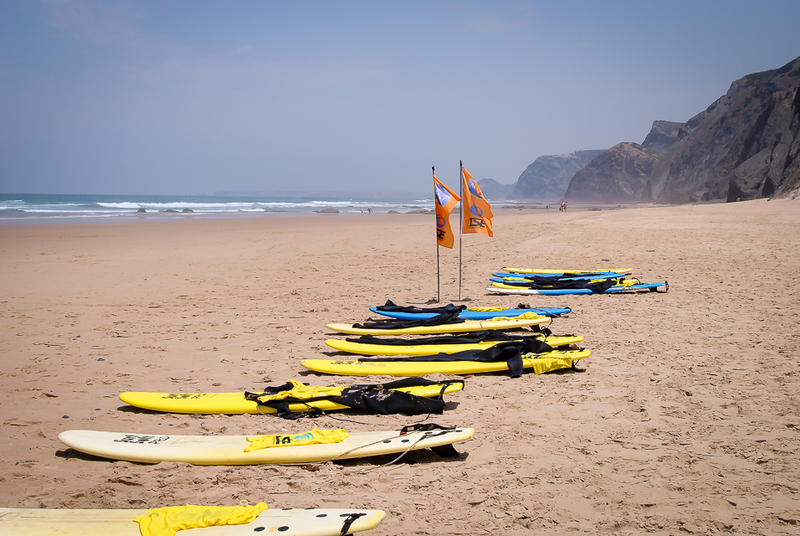 One of the oldest schools is The Surf Experience, and since we were a little nervous to tackle surf lessons for the first time we wanted to go with the tried and true professionals. It was also especially convenient that we were able to book as few or as many days as we liked. I would love to go back for a weeklong surf + yoga retreat, but this time around we just didn’t have the time. We were picked up at our apartment bright and early, transported to Vila Catarina to get our gear and then transported to Praia da Cordoama. After a quick group warm up and stretch, Summer and I were pulled aside along with four other newbies to review the basics with Rik. Rik gave us a crash course in paddling and timing, then sent us out to practice catching waves for awhile. No standing, just riding a wave in, lying on the board. Instead of rushing out eagerly, we both stood sort of paralyzed. He gave us a little push and we slowly meandered out into the waves. All of a sudden the ocean seemed a little bigger. And the big beginner’s board felt so heavy. And the current kept dragging me back despite my best efforts to push forward. 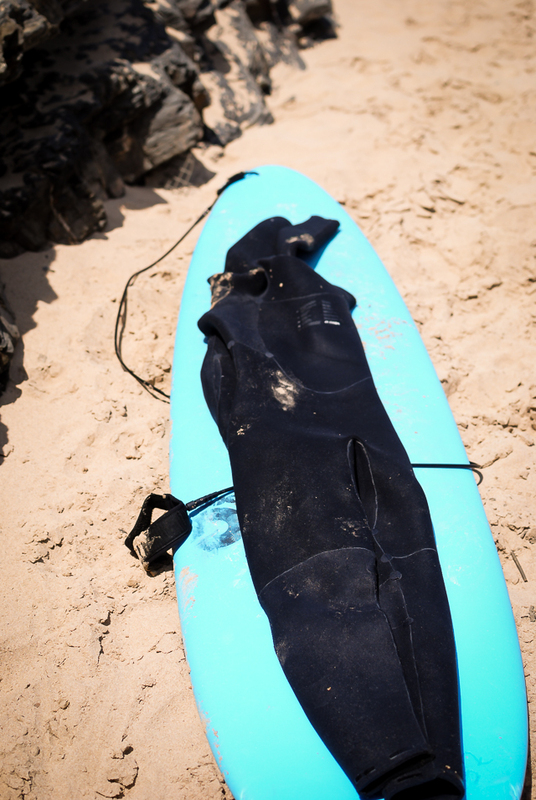 The interesting thing about surf lessons is that the instructor can sit next to you out in the water or watch you from the sand, but once it comes time to catch a wave, you’re on your own. There’s minimal hand holding. I felt a little silly boogie boarding while the other students around me were already standing but I quickly learned the only way I was going to succeed was to accept where I was before moving forward. If I tried to go out too far, where some of the more advanced students were floating, I’d get rocked over by a wave as it crashed. But if I started a little closer in, I had time to position myself and paddle so the wave would pick me up and carry me forward. Instead it went like this: struggle to get out against the current, forget Rik’s advice and turn the board around between myself and the wave, hop on board, paddle, make a comedic attempt to stand up without bending my knees, immediately fall off board, cover head, cough a little bit, wipe water out of eyes, drag surf board back by the leash, turn around, repeat. It was exhausting. It felt like I was battling waves, not riding them. Before I realized any time had passed we were being called out of the water for lunch. It was a nice long (much needed) break and we took the time to meet a few of the locals – the surfers and the pups. There were dogs roaming around all over the beach so it was hard to tell who they belonged to, but they based their loyalty on whoever had the best snacks to offer. Back in the water for the afternoon, I was determined to stand up. By this point any fears or hesitations that I had from the morning were eclipsed by my focus. We had spent some time chatting with Rik at lunch and he gave us a few pointers to help us get up. There were many botched attempts but I finally caught a (wobbly) ride in on a wave. And once I caught that first one, standing up became so much easier. It all clicked and I only needed to worry about tweaking the details (like stance, posture, balance, looking good – you know, small details…). The waves we were catching may have been the ocean equivalent to swimming in the baby pool but I was happy as could be. I was so proud of myself, you would think I was on my way to being a full blown professional. But as it turns out, baby steps make for just as much excitement. 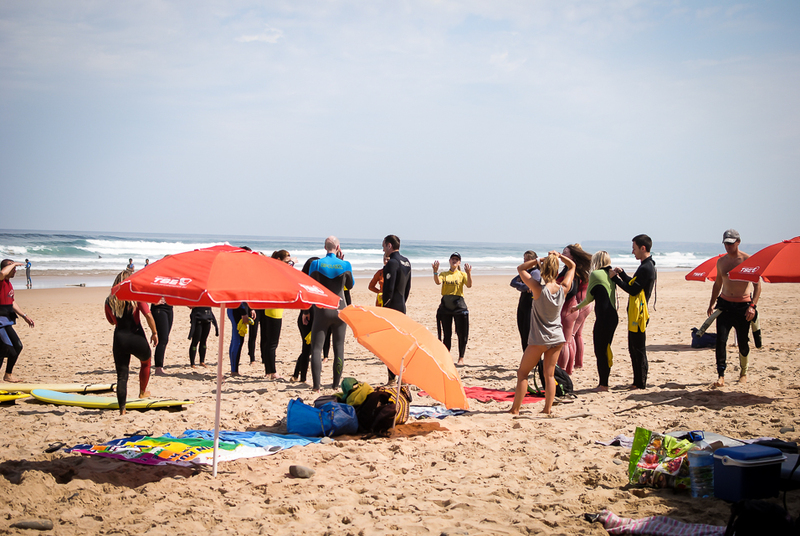 A big thank you to The Surf Experience for hosting us at their surf school!